In the last article, we saw what an estimote is, and how it works. It's time, my friends, to get our hands dirty. 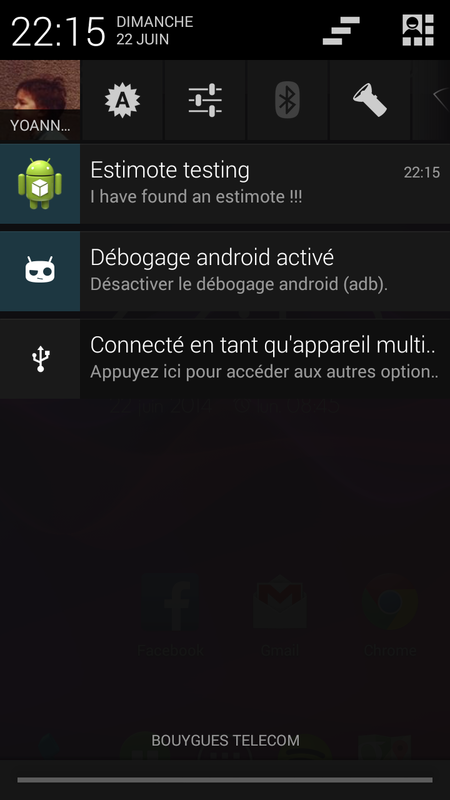 The main goal of this article is to esplain how to monitor if we get close to an estimote beacon in an android application. We don't especialy want the main app to be launched to do this, we just want a notification to pop if we are close to a beacon. No error handling here : that's not our point. To do this, we will create a receiver, a service, and launch the beaconManager service, provided by the estimote api when required. - When bluetooth is turned on, for example when the system boots or when the user decides to turn it on, then we start a service, which will start the monitoring activity. - When bluetooth is turned off, then we stop monitoring estimote beacons, and stop the application service. Step 1 : Reacting on bluetooth status changes. This will tell the Android system that we intend to launch a receiver, which class name is "EstimoteService", and which is expected to receive only system broadcasted events related to the bluethooth status changes (when bluetooth is turned on or off). Step 2 : Create the receiver. Step 3 : Let's create a service. We need to create a service, because we just can't launch the estimote monitoring from the receiver. The receiver's phylosophy is to perform quick tasks in reaction to broadcasted events. Tasks running for more than 10 seconds in a receiver are automatically killed by android itself. As you can see, we now need to go into the real thing : estimotes monitoring ! Step 4 : Let's start monitoring. // We want the beacons heartbeat to be set at one second. That's all we need ! You can get your hands on the source code by following this link.